Luke Timothy Johnson is the Robert W. Woodruff Professor of New Testament and Christian Origins at Emory University, Atlanta, Georgia. Luke Timothy Johnson is an outstanding biblical scholar but also a writer with a rare gift for writing profoundly yet simply for a wide general audience. In this new book, Johnson examines certain key themes in the New Testament as they apply directly to the Church today. The Gospel is the central content of the Christian revelation, the glad tidings of redemption. 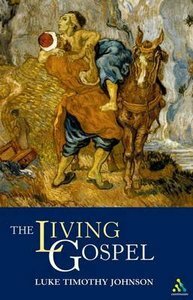 Just as Christ's own teaching is a Gospel, so Johnson's passionate concern in the pages of this new book is how this Gospel can be preached and lived out today.The book divides into three sections - Theology, Scriptural Reflections, and Jesus. "One of my constant preoccupations," writes the author "is how to read the Scriptures for the life of the Church in a manner that is at once loving and critical, challenging yet charitable. "This book of short accessible chapters, contains Johnson's thought in concentrated and fresh form. Luke Timothy Johnson (Ph.D., Yale University) is Robert W. Woodruff Professor of the New Testament and Christian Origins at the Candler School of Theology, Emory University. A Roman Catholic, Johnson was a Benedictine monk and priest before becoming a biblical scholar. He is the author of several scholarly books and has written for Commonwealth and Christian Century. Some of his many books include Hebrews: A Commentary (New Testament Library); Brother of Jesus: Friend of God (Wm. B. Eerdmans); The First and Second Letters to Timothy (Anchor Bible: Yale Universtiy Press 2001); Living Jesus: Learning the Heart of the Gospel (HarperOne 1999); Reading Romans: A Literary and Theological Commentary (Crossroads Press 1997); Letters to Paul's Delegates: A Commentary on 1 Timothy, 2 Timothy and Titus (1996); The Real Jesus: The Misguided Quest for the Historical Jesus and the Truth of the Traditional Gospels (HarperOne 1996); The Letter of James (Anchor Bible: The Doubleday Religious Press 1995);The Acts of the Apostles (Liturgical Press 1992) and Luke (Liturgical Press 1991). 1. Towards A Biblical Theology For Lay People; 2.how To Read Scripture; 3. Jesus.